The beautiful illustrations were done by Keanne van de Kreeke, a Belgian artist living in Finland. The story is a rather unusual princess story, where princess Ellinoora is trying to find her laughter which has gotten lost in the midst of quarrelling parents and accumulated wealth that doesn’t interest her. I was in a studio in Belgium mixing the Platypus Ensemble’s recording Life@Play. We finished early, some studio time was left and I decided to record a couple of spontaneous improvisations as a gift to take home to my then 5-year old daughter. My daughter liked the music, so I decided to give a copy of the tunes to Tittamari to see if she would like to write a story to the music. 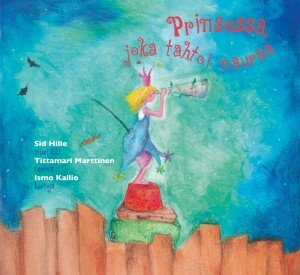 Tittamari got inspired by my improvisations and came up with this funny modern princess story. Listening to the music now, almost ten years after recording it, I am still very pleased with its spontaneous, playful and happy atmosphere. Additional to my main instrument, the piano, I am playing all sorts of folk instruments that I have never really studied, like ocarina, kantele, mouth harp – this is probably what gives the music such freshness.